This mural is in a brand new park, called Cougar Park, in Covina, CA. Covina was once a major citrus growing area, and at one point in the early part of the the 20th century there were about 25,000 acres of citrus being grown in the Covina area. During that period there was a brand of oranges from Covina called Cougar Brand Oranges, from which the park takes its name. 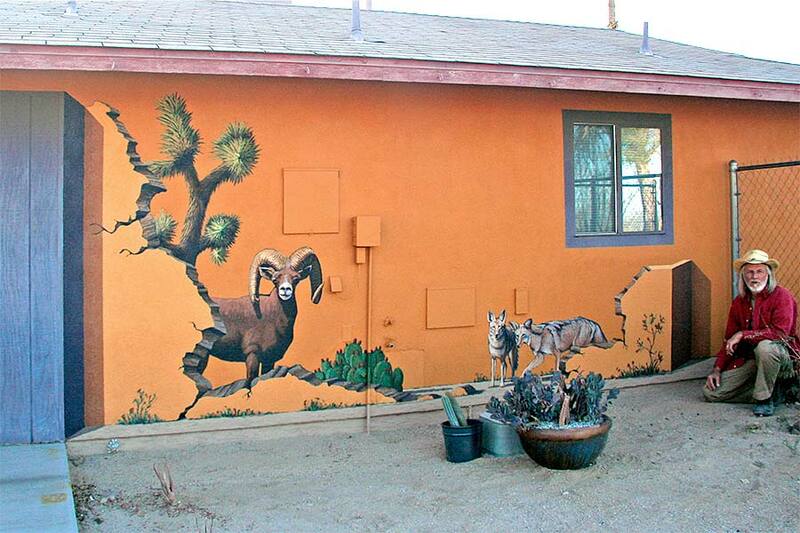 This mural is in the back yard of a private residence in Twentynine Palms, CA. The mural is painted on the side of the brightly painted guest house and faces an expanding desert garden and views of the hills and mountains of Joshua Tree National Park. 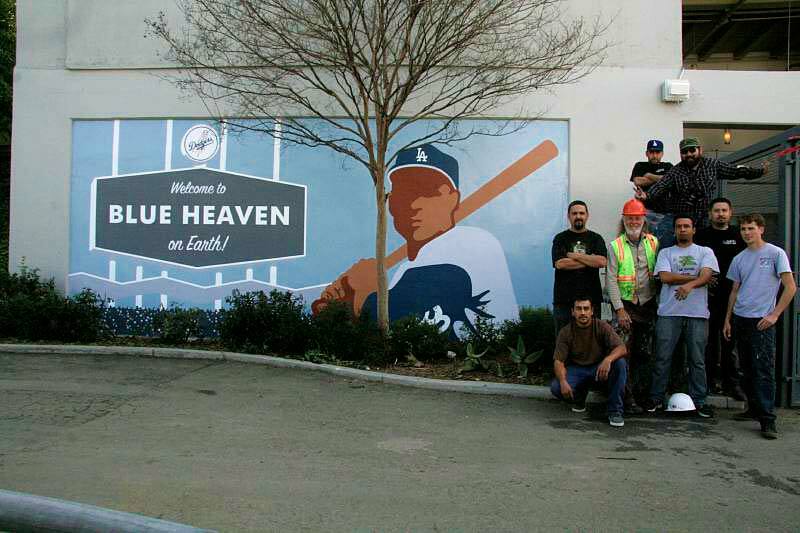 Art and his crew of painters were hired to do a series of murals and directionals at the newly renovated Dodger Stadium in Los Angeles before Opening Day of the 2013 season. Here are photos of a few of the pieces they did. 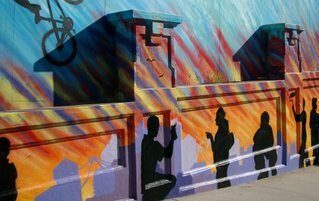 The local CBS affiliate in LA just published an article on their website about "The Best Murals in Los Angeles," which includes my Alhambra Archway mural. It's an honor to be on their list, and an honor to be mentioned along with to Mr. Siqueiros. Art recently completed this small mural, featuring a local denizen with her dinner, in a private residence in this desert oasis town. The newest mural, completed in December on the Balboa Peninsula in Newport Beach. Plus a link to an article in "The Daily Pilot," the LA Times' Orange County supplement, which pretty much explains what the mural is about. 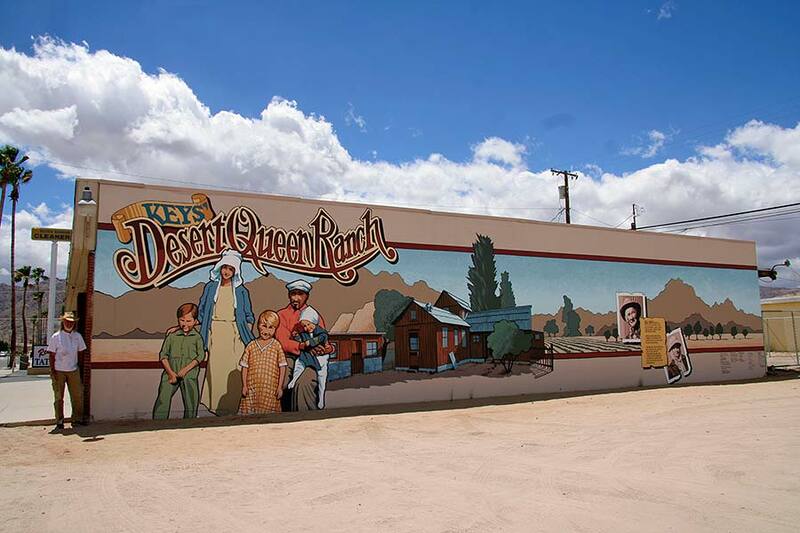 This 'Mural In A Weekend' project in Twentynine Palms, CA was painted on April 13 & 14, 2013, by Art and a large group of volunteer artists. Art spent the previous week laying the design out on the wall and mixing up all the colors with the help of a few locals, then the volunteers came on Saturday and Sunday to paint in the mural. 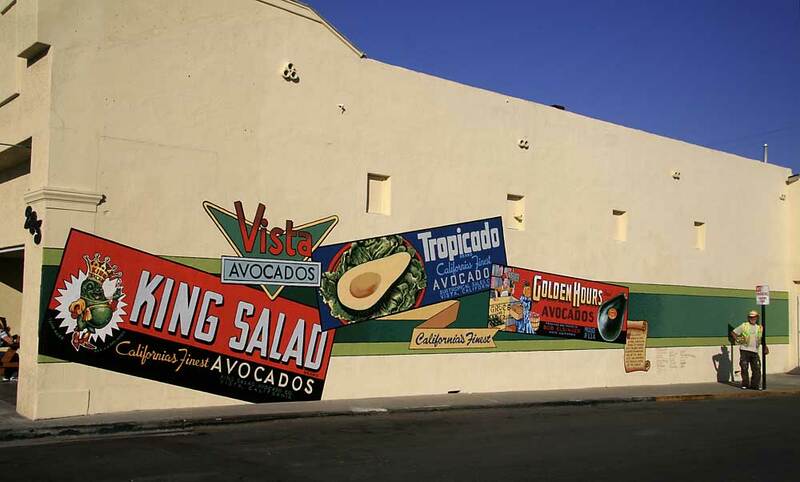 This Mural-In-A-Day project in the heart of the old downtown district in Vista, CA celebrates Vista's past importance as the "Avocado Capital of the World." Art grew up in Vista during its avocado heyday and was very happy and excited to be asked to create a mural celebrating those days. A few community volunteers joined in to lay out Art's design on the wall and then a larger group came on Saturday to paint it in color. This mural is in Hermosa Beach, CA on the side of a large public parking structure in the heart of downtown Hermosa Beach, less than 1 block from the beach. 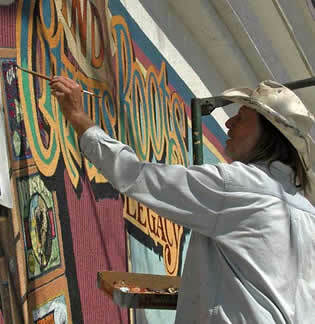 It is the first of several historical murals planned by the local Murals Program. 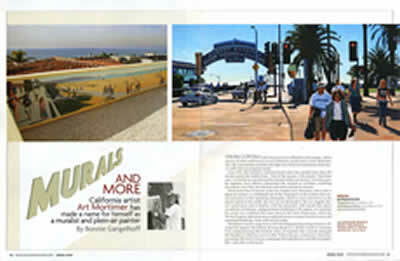 The mural depicts a view of Pier Avenue, which is about 1 block from the mural, looking along its last block as it runs down to the Hermosa Beach Pier – as it looked in 1924. The mural is on Mission Road, which runs through Alhambra and originally connected the nearby San Gabriel Mission with the Mission in downtown Los Angeles. This section of busy Mission Road now separates a residential neighborhood from the Southern Pacific Railroad tracks. The mural is on the wall that separates the neighborhood and Mission Road from the railroad. While working on the mural, the one lane of traffic closest to the wall was blocked off and there was no sidewalk; it was a pretty intense experience at times. Vale, Oregon "Mural In A Weekend"
My latest mural project: A "Mural In A Weekend" was completed in Vale, Oregon on August 28-29. I spent the week beforehand working with a few volunteers to lay the design out on the wall and mix up all the colors. On the 28th and 29th a larger group of volunteers showed up and we painted until it was done. A gallery of images will be added to the site soon. I just finished a new Mural-In-A-Day project in Vista, CA (in northern San Diego County). It was quite an adventure. The mural is on the side of a small building in a neighborhood park, next to a large, very busy soccer field and some basketball courts. Teams of all ages, and their families, come to play soccer as well as basketball. The building is currently used as a Sheriff's substation and houses the bathrooms for the park. 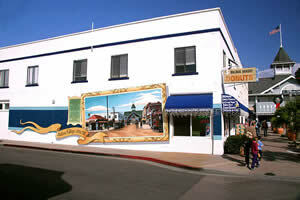 In September of last year I completed my large mural for the new Pacific Island Ethnic Art Museum in Long Beach. The museum is due to open soon. Their new website now has information about this unique institution as well as some description of my mural and a link to my website with photos of the building. Here's a link to their news page about the museum and some information about my mural. Here's a website that is attempting to catalog all (?!) the public art in Southern California. Interesting project. Is your community represented? If you're in SoCal and not represented, apparently you can submit entries. 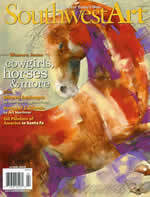 An article in the April issue of Southwest Art Magazine spotlighted a number of Art's mural projects over a six-page spread, including a good conversation with the artist. "FROM COVINA and Crescent City to Alhambra and Lompoc, and in dozens of other small towns across California, people know of Art Mortimer. He's the consummate muralist who slips into town and transforms drab stucco walls into eye-popping murals."